Yesterday, my family went to Applebee's. Applebee's is a solid member of the mid priced chain restaurant club also known as casual dining. Lately, many members of this club have gone bankrupt, with 2011 being a banner year. The last time I went to Clackamas Town Center, Chevy's, and Macaroni Grill had completely disappeared. I would call these restaurants economic early warning indicators, like a canary in a coal mine. Just like canaries, many of this type of restaurant are short-lived due to the trendy factor, or coping problems with competitive forces, but when many of them fail they represent symptoms of greater economic malaise. The barriers for mid-priced chain restaurants' entry are lower than many types of businesses, being mainly creative decor, a menu differentiated from the competition, leased space, and used equipment. Most of these restaurants seek to sell a theme and happy memories just as much as tasty food. Other similar chains (in my mind, you may have other ideas...) are Red Robin, Buffalo Wild Wings, Stanford's, Old Chicago Pizza, McGrath's, Beaches, and many many others. The trip to Applebee's was eye-opening. I tend to eat at this chain when on business because the food can be healthy and the home office accountants never quibble at the price. Over the years, I've seen the introduction of the two meals for $20 menu, and lately the two meals for $25 additional menu. The menu, similar to other chain players in this industry niche, generally have specials that are close to the same as items deeper within the menu. However, the deeper menu items are always cheaper. The fast sell must be effective. Over the years, the portions have decreased. The other night, I got a '7' oz sirloin that was the size of one and one half decks of cards. With my meal, a member of the two meals for $25 club, I also received 15 pieces of potatoes, and a 1/4 cup of mixed sauteed mushrooms and onions. I paid extra for the side Caesar Salad, which consisted of roughly a half cup of romaine lettuce, croutons, cheese and dressing served thinly on a 10 inch plate to make it look bigger. The only item that reminded me of the old days was the appetizer; 8 mozzarella sticks. The service was fantastic, and the atmosphere was sporty with plenty of happy people. I am picking on Applebee's because I was there recently. I've seen similar techniques in operation at Stanford's, Red Robin, and others. This type of restaurant is developing ways to survive in the face of radically increased food prices, increased labor prices, increased energy prices, a poorer consumer, and a political climate (due to Obamacare) that frowns on the calorie excesses of yesterday. All in all, we had a pleasant visit and we will eat there again. I feel strongly that the meal was better for our health than previously, and the number of calories in the meal didn't break the bank. The shifts in the business are innovative trends that mean this chain and others who practice innovation will survive (Just as Joseph Schumpeter predicted), unlike those others who had to declare Chapter 7, 11, or 13 bankruptcy. When I went to Applebee's, though, I didn't expect to see the stroke of brilliance I saw on every table. Every table had a 7" Presto tablet mounted on a sturdy steel stand. At this time, you couldn't order your main meal on the device, but you could order appetizers and desserts. You could also play games for 99 cents. The tablet had a card scanner on top. I thought about the possibilities. Robotics and automation in many forms will revolutionize how we live life. I think the first development was the automat, first seen in the US in the 1900's. This technique was competitive because the wait staff was not needed. 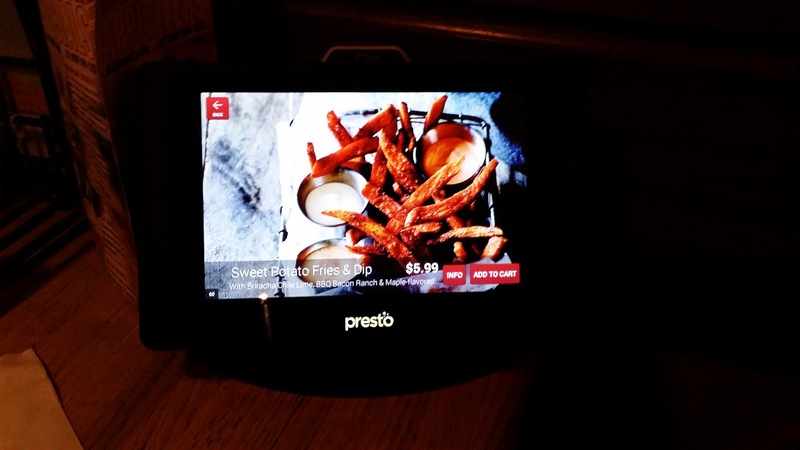 I see ordering on a tablet and then getting the food delivered to your table as an evolution in the concept, and for the restaurants using this system, a method to regain competitive ground lost to external factors. Modern methods of automation would include the semi-automatic drink pourer in the McDonald's drive through. 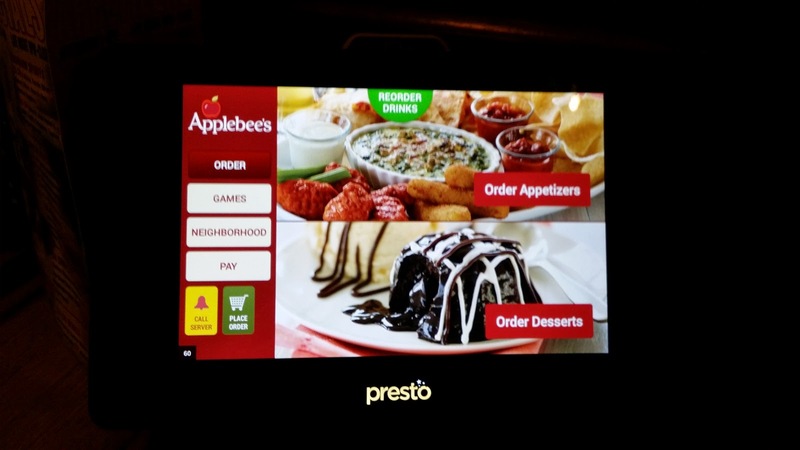 I think the way Applebee's was introducing the tablet, as a method to order appetizers and desserts, was training their customers in how to use the tablet. My first manager, Tony Barnas at McDonald's always said more than half our job was training the customer, and I've always found his words to be true. 1) Customers order and pay using the tablet. The tablet uses suggestive selling to fill in menu holes and increase average check. The hybrid process eliminates about a third or a half of the human staff because of no need for order takers. But the hybrid process is only the beginning. Adding in Robots can help reduce staffing levels even more. 4) Party leaves and robots clean the table. This next step would also eliminate kitchen staff. Using robots and automation would address many of the increasing costs restaurants face. Increased food prices would be addressed through better portion control from a robot. Increased labor prices would be addressed through fewer human workers. Increased energy prices would be addressed through less HVAC (Heating Ventilation and Air Conditioning) in the kitchen, less lighting for robots, and more efficient operation. A poorer consumer could be addressed by lowering prices while increasing the quality of the food due to savings in other areas. This is a recipe for competitive advantage in the mid-priced restaurant or casual dining niche. The usage of automation and robots will add further layers to the development of non-humanly staffed restaurants and other retail outlets. In the short term this will be a great development for owners of casual dining chains. In the long term, eliminating that much employment will have ripple effects. These ripple effects are already becoming apparent in the disappearance of the middle class. The usage of technology makes many middle management tasks unnecessary and enables supervisors to boss more people. In the case of a robotic and automated restaurant, perhaps five servers and a bar tender would be needed on a shift. The social ramifications of this development will be far reaching.